36. Scafati, Villa rustica in Fondo de Prisco, contrada Crapolla. Ruins of a villa rustica in contrada Crapolla, excavated by Vincenzo De Prisco on his fondo at Scafati. It was just over a kilometre away, in a straight line, from the eastern walls of Pompeii, three hundred meters south-west of today's  building, known as Lazzaretto, at the southern edge of the De Prisco fondo, where it borders property of the sig. comm. Annibale Fienga. Today it is between via Capone and via Domenico Catalano. Notizie degli Scavi di Antichità, 1923, pp. 284ff. Casale A., Bianco A., Primo contributo alla topografia del suburbio pompeiano: Supplemento al n. 15 di ANTIQUA ottobre-dicembre 1979, 73, p. 43, fig. 20. Crova, B., 1942. Edilizia e tecnica rurale di Roma antica, Milano, pp. 181ff., fig. 32. Day, J., 1932. Agriculture in the life of Pompeii: Yale Classical Studies, 3, tav. A, B, C, n. 36. Fabbricotti, E., 1976. I bagni nelle prime ville romane: Cronache Pompeiane, 2, p. 45, fig. 11, note 29. Rostovzev, M., 1973. Storia economica e sociale dell'Impero romano, Firenze, 5° ediz., p. 34, note 26, n. 36. Van der Poel, H. B., 1981. Corpus Topographicum Pompeianum, Part V. Austin: University of Texas, no. 36, p. 22, and plan. Scafati, Villa rustica in Fondo de Prisco, contrada Crapolla. 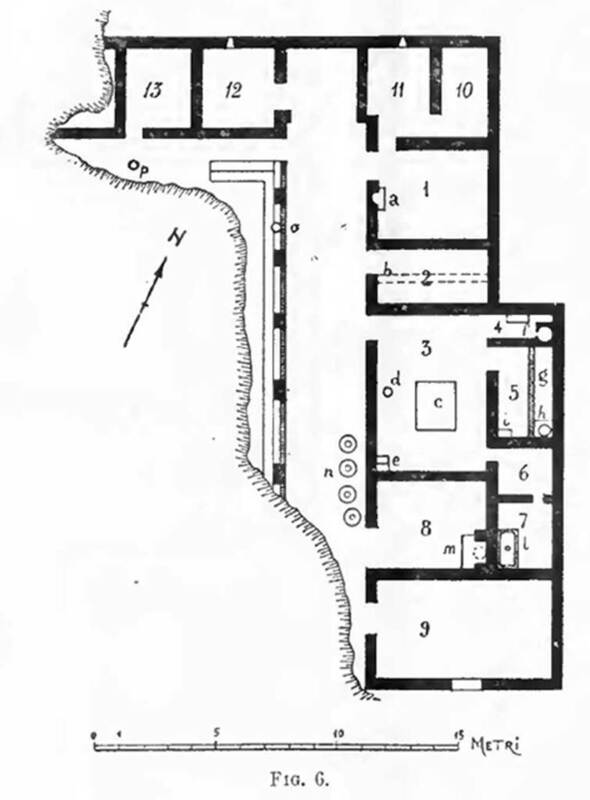 Plan of villa. See Casale A., Bianco A., Primo contributo alla topografia del suburbio pompeiano: Supplemento al n. 15 di ANTIQUA ottobre-dicembre 1979, 73, p. 43, fig. 20. See Fabbricotti, E., 1976. I bagni nelle prime ville romane: Cronache Pompeiane, 2, p. 45, fig. 11. Della Corte 1921 Note: Excavations undertaken by private citizens in the Pompeian territory. (Ten years ago, by commission expressly from sig. Soprintendente prof. Vittorio Spinazzola, I had to prepare an extensive report, accompanied by numerous photographs, plans and drawings on eleven private excavations of which no news had been given yet. But now that every investigation to find it has been in vain, so it must be considered as definitively lost, and now the Soprintendenza considers that gap must be filled, not without pain, I have redone the work already completed and with this and other subsequent reports, I will give news of the precious topographical antiquarian material, unearthed in the excavations). Della Corte’s report from NdS 1923. This villa rustica was partially explored by sig. Vincenzo De Prisco in a fondo he owned at the Contrada Crapolla, Scafati. In a straight line, a little more than a kilometre away from the eastern walls of Pompeii, at around three hundred metres to the south-west of the present-day building , known as of Lazzaretto, on the southern edge of the fondo De Prisco, where this adjoins with the ownership of sig. comm. Annibale Fienga, the ruins of the villa rustica were discovered, that I present here in the plan (fig. 6). Given the extreme scarcity of finds, explorations were soon abandoned, so that the building as now described, was presented regular in its lines and well orientated, a considerable part of the east side and a small part of the north side were explored. To the south of room “no. 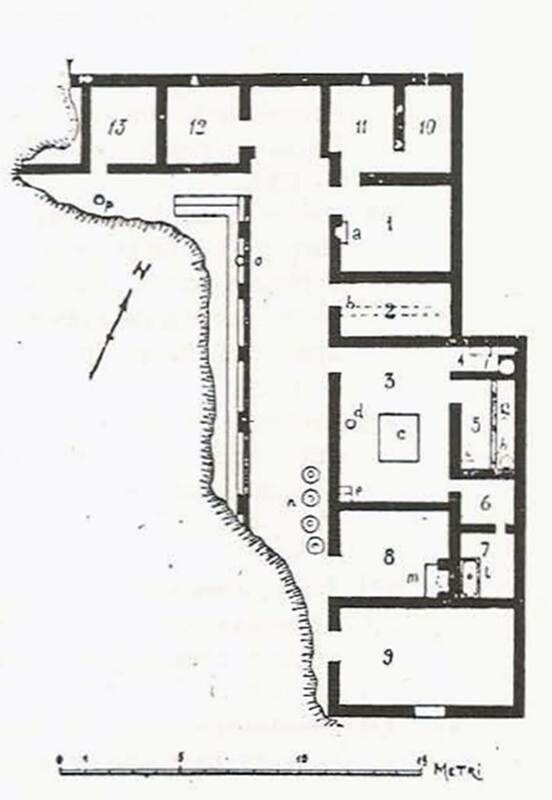 9”, most probably the villa had its own entrance on the eastern side, on the same axis as the secondary entrance from the west, according to the diagram met many times showing similar country farms, consisting of a single large central courtyard, with a number of rooms for each side of the courtyard. Here the volcanic debris and humus did not exceed the height of 4.30m, and facilitated the work of ancient and modern explorations, which damage was clearly manifested in more than one point: it was certain, however, that rooms brought back to light were the more humble part of the villa, by the absence, or nearly so, of any wall decoration worthy of the name (the walls had brick plaster in the rooms "nos. 1, 12 and 13 "; rough white stucco, in room "no. 11"; white stucco above a black dado/plinth, in room "no. 7"; white stucco above a red dado/plinth , in room "no. 6"; the remaining rooms were rustic, and by the poverty of the floors (of cocciopesto in rooms "nos. 1, 6 and 7"; in calcestruzzo (concrete) in rooms “nos. 12 and 13": and of simple beaten earth in the remaining rooms). See Notizie degli Scavi di Antichità, 1923, pp. 284-5. Scafati, Villa rustica in Fondo de Prisco, contrada Crapolla. 1923 Della Corte Plan. See Notizie degli Scavi di Antichità, 1923, p.285, fig. 6. Entering into room “no. 1, the walls had brick plaster and the floor cocciopesto. On the right was a niche “a”, used as a hearth, protected above by a protruding tile and tilted forward: traces of carbon black all around. Certainly room “no. 2” was a stable, along its longitudinal axis ran the wall “b” to support the raised platform to the south and functioning as a manger: here were found the skeletons of a horse and some chickens. The floor was of simple beaten earth. In room "no. 3", the centre of the displuviate atrium contained the podium of the kitchen "c", 1.75 x 2.05 m wide, on whose surface were the considerable remains of carbon and ash, while in "d" was a large volcanic stone mortarium and in "e" the masonry support of the wooden staircase leading to the upper floor. The spacious kitchen was from the vestibule to the small rooms behind. In room "no. 3" [Should this be room 4? ], beyond the little oven, "f", completely demolished in remote explorations, there was, against the north wall, a basin/tub coated with polished brick plaster, while the space between the oven and the remaining northern wall was used as a repositorium. The adjoining room "no. 5" was divided longitudinally into two halves, in which that in the east formed a large raised podium, with the edge 0.20m high, and all covered with brick plaster, "g", while at "h" was a circular basin/tank with a raised edge. On the podium was deposited a load of quicklime. In "i" was a podium that was definitely used as a hearth, because everything found there was covered with ash. I would not even presume to call room “no.6”, with walls of white stucco above a red dado/plinth and floor of cocciopesto, an apodyterium, by which one entered to the poorer room "calidarium 7”, with walls of white stucco above a black dado/plinth and floor of cocciopesto, crossing an arched doorway, only 0.51m wide, which closed from within by a single wooden door (similar to the access from the kitchen to the apodyterium). Quite interesting was the rectangular bath tub, with full and rounded corners, and opening in the middle of the base, in a circular opening of 0.20m, occupied by a bronze cylindrical vessel, of the same diameter, placed in contact with the fire. There was no double wall here, but the floor was suspended. In "m", in the neighbouring room “no. 8”, was the boiler (praefurnium), of which nothing remained at the time of the excavation, if not the rectangular opening of the furnace, in volcanic stone blocks; the imprint, visible in the masonry above the boiler; and a hole in the wall at the point where the pipe carried hot water to the bath tub. According to Fabbricotti, the remains are sparse, but there is a small apodyterium, a poor calidarium with rectangular basin that has a circular hole of diameter of 0.20 m, in its centre, occupied by a bronze vessel. See Fabbricotti, E., 1976. I bagni nelle prime ville romane: Cronache Pompeiane, 2, p.45-6, fig. 11, Note 29. Of uncertain use was the large rustic room "no. 9", illuminated from the south by a spacious window. In room "no.11", with walls of rough white stucco, which formed an anteroom of the cubiculum "no.10", to the left of the entrance passageway, Juno was painted on a white background. The painting of Juno was 0.34m high, and shown with a golden diadem on her head and peacock at her feet, dressed in a white gown, a green chiton and purple-blue cloak, the west and east walls of this room were largely demolished in previous explorations: there was a small window for light in the north wall. Another similar window was in storeroom “no.12”, the walls had brick plaster with the floor in calcestruzzo (concrete) and, on whose walls, remained intact the impression of wooden shelving in three sets above each other. In the last room “no.13”, the walls had brick plaster and the floor was in calcestruzzo (concrete) and nothing particular was seen which was worthy of mention. The portico was made of arches set on pillars (not all of the same size) in rustic opus latericium, with a pluteus in opus incertum, 1.50m high, linking together the pillars already mentioned. Four large terracotta jars (dolia) were found at "n"; a puteal was found at "o", at the point where the arms of the gutter which collected the portico rainwater converged and emptied into the pool/cistern; there was another puteal at "p". The top of a cane with protruding corners, and a buckle, found in the same room together with a pyx, a cylindrical vessel, from iron, divided into four equal segments thanks to an iron part arranged in a cross; the vertical wall of the pyx was coated with a sheet of “talco” (talc, mica or selenite? ); the cover, made of bronze, had a central knob and four peripheral holes for fastening tapes. Three hoes/mattocks, an axe, a chisel and hammer, pick, and a hammer and pickaxe nosecone, unearthed in the exedra, between the rooms “nos. 11 and 12”; a harrow with six teeth found near the large earthenware jars. An elliptical weight 0.09m long, with iron handles, found in the storeroom. A small rounded amphora with flat foot, height 0.20m. Scafati, Villa rustica in Fondo de Prisco, contrada Crapolla. 1923. Portico. Inscriptions CIL IV 6932, 6935, 6941, 7000 and various Greek inscriptions recorded by Della Corte from four amphorae. See Notizie degli Scavi di Antichità, 1923, page 287.